With TVU Player gone, what are some working PC TV alternatives? TVU Player was one of the first TV on PC programs that I reviewed here on Ghacks, and while I have not used the program in years, it is still sad that the parent company, TVU Networks, decided to pull the program and its capabilities from the Internet. 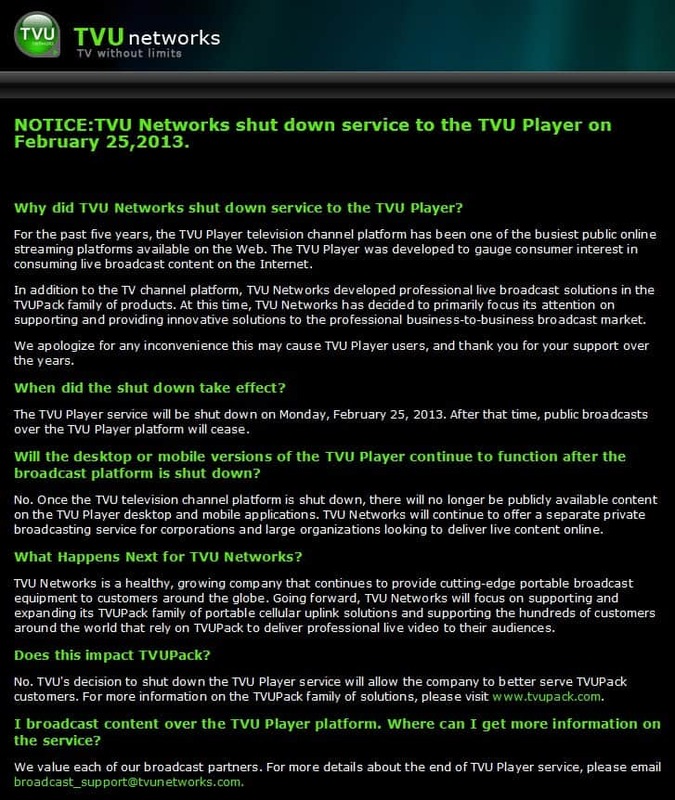 The download pages are already removed from the website, and the start page lists a notice that TVU Networks shut down the TVU Player service on February 25, 2013. What this means is that clients do not work anymore even if you do run them on your system. One of the main reasons for pulling the plug on TVU Player is likely the move towards streaming websites instead of applications. While you still have an arsenal of software players at your disposal, with Sopcast probably leading the field in any way imaginable, you will find the majority of streams, especially when it comes to live events like the football world cup, European football leagues, American sports like baseball or football (the one that you play with the hand most of the time), on Internet sites. The core reason for this is likely money that can be made with streaming those events on the Internet. Most of the time, you are bombarded with ads, something that you can't really do in software players. While you can still use Sopcast to watch live TV, the bulk of what is being offered right now is found on websites. Sopcast uses an English interface. It makes available a couple of live and recorded channels, mostly Chinese and Russian but also some English channels that you can watch with the click of the button. PPLive is Chinese only. The website is in Chinese and you will have a hard time figuring out how to download the application from it. Veetle makes available all of its channels right on the homepage of the service. It does not seem that you need a client anymore to watch those. As I said earlier, the majority of streaming services are now streaming directly on the web so that you do not need to install programs on your system to watch live sports or television. What you do need though is Adobe's Flash Player as it is usually used for the streaming. You can check out the excellent Wiziwig for a start for instance, or Live TV which is a Russian site with different language interfaces. Check out our MyP2P.eu alternative listing for additional services that you can use in this regard, and our TV on PC list for additional software programs that you may want to check out. Some streaming services display messages during buffering that you are missing a plugin. That's not the case though and you can simply ignore those messages. I would not recommend installing those plugins on your system. Just wait and the stream should load just fine. Have another recommendation in this regard? Feel free to share it in the comments. Never used the application?/website myself. But i asume this is all about streaming tv shows etc. You guys do realize that shoutcast is able to stream video right using the nsv format. The nsv format does support vp8 even in winamp vlc also supports it. People can stream there own shows on there if you have winamp you can view the shoutcast tv listing directory. Nothing is stopping people from using it :). So more people that stream on there the more shows to watch. Hope i didnt confuse this if so you may delete my post. You be wrong , Please do not assume. It waists Time and makes you a troll. TVU Showed Live Disney ,Showtime and HBO at first for first year, then just Disney. Later Disney stopped. But it supported home made movie channels live broadcasts, with some 3rd party apps you could live stream a channel from a TV card. It was great and fast and used a P2P network to upload as you watched Prioritizing channels more watched, not just you wear watching. so you download a western channel and in a bit-torrent like system it would upload it, but also upload and the cache all your favorites. Resulted in very fast hi quality LIVE service. And wonderful channel list. So not Like winamp in Anyway. Unless you can do that with winamp please do not comment on it and stop commenting on stuff you never used in General. ThuGie, it’s not about streaming tv shows – it’s about getting live streams of popular tv networks in real time. Thats what TVU was good for. There was also an app called RtmpGui (now dead) that streams most cable tv channels in real time. This is preferred to streaming video because sometimes you just need to catch CNN live and dont wanna do it through a browser ow watch your daily soap operas, Syfi channel etc. Free cable like TV from your desktop – that rocked. I do hope someone makes another app to do this. does it work in south africa? ive downloaded it today and i dont an access to the internat at home…does it work offline or not?